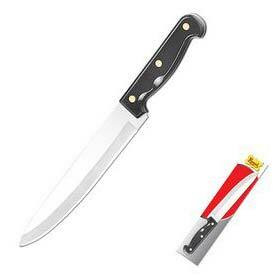 We are an eminent Manufacturer, Supplier, and Exporter of Full Blade Rivet handle Knife in Rajkot, Gujarat, India. We offer it in various dimensions, to satiate the varied requirements of our clients. We are backed by adroit professionals, who manufacture it with the utmost precision. The entire range of our Full Blade Rivet Handle Knives is examined on the basis of various quality parameters before the final delivery. We offer it at the leading market rates.